Get on the dance floor and enjoy the DJ changing the rhythm in the party-themed video slot machine with 5 reels, 3 rows and 25 fixed paying lines produced by Stakelogic. Win up to 125.000 coins with Wilds, Reel Upgrades, the Hardwell Free Spins and the SuperSpin Feature in a game that you can play online across multiple devices. 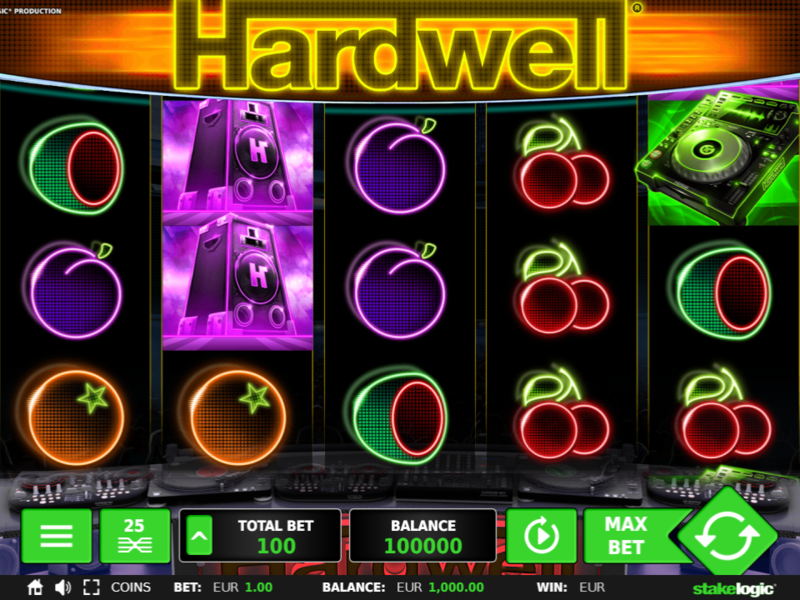 There some tips and tricks to be picked up in a chase for a big win, so read the Hardwell slot review to get them now. We have no free play mode available yet, but take a look at the Hardwell screenshots instead. Or why not simply giving a try with one of the recommended casino sites above? If you want to learn how to win, start the Hardwell free play mode and receive enough credits to find the way in and around. Real money gaming is based on the appropriate strategy that can be implemented given the coin denomination from €0.01 to €0.20 and wagers between €0.25 and €50. Themed icons such as DJ, turntable, earphones and other dominate the paytable and bring between 200 and 5000 coins for a combination of 3-5 of a kind. Regular symbols will be locked during the randomly-triggered SuperSpin, while the reels will keep spinning until form a winning combination. You can land a big win when a maximum of 15 Gold Disc symbols appear. Collect 2 or 3 bonus icons to start the Hardwell Bonus round with a maximum of 3 Reel Upgrades active: random Win Multiplier of up to 10x applied to the line win, Win Both Ways that makes the game pay for combinations formed from both left and right, Wild Fruit on reel 3 and Expanding Wilds. There is no need to download an app for iPhone or Android in order to play online directly from a browser. Stakelogic powered sites allow you to play for fun or for the real money. 3. What is the RTP factor of Hardwell? The RTP stands at 96.04% and this info should be useful to all the potential winners looking to score the jackpot of a maximum €25.000. Music fans will be thrilled to have a themed slot machine that combines nightlife atmosphere and enough money to finance your summer festival tours. Still, a thing to bear in mind is volatility and payout that are not so frequent as one may thought.